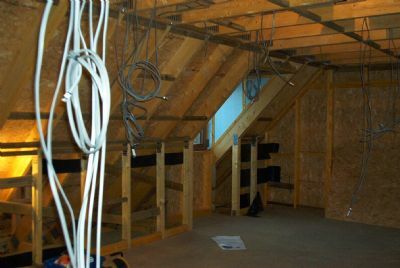 A busy weekend trying to stay ahead of the joiners, but by Sunday evening the upstairs wiring is finished. 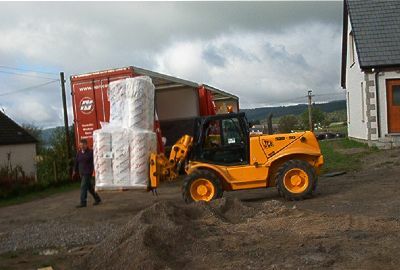 Norscot deliver the next batch of materials - insulation, interior partitions and stairs. Once again Gavin does the business with his teleporter, and you can see him in action on the VIDEO page. Michael and his guys return to put the finishing touches to the roof (i.e. 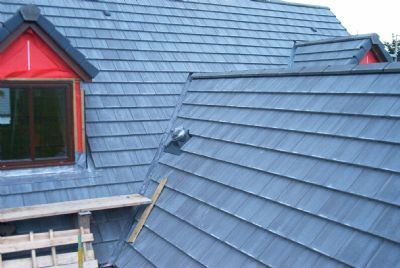 the ridge tiles). We are now officially water-tight! And finally, the plumbers join in the fun by making a start on roughing-in the waste pipes. It's been a busy day on site. 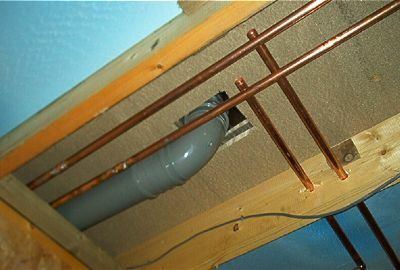 The plumbers crack on with (and complete) roughing-in the copper pipes for the hot and cold water supplies to the bathrooms and kitchen. 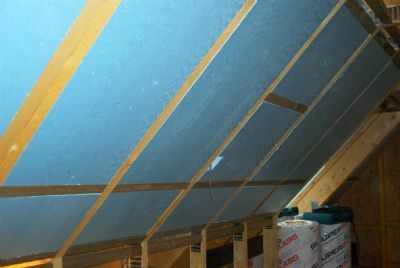 Morning spent inserting 150 mm rigid insulation (3 x 50 mm sheets) into the coombes upstairs. 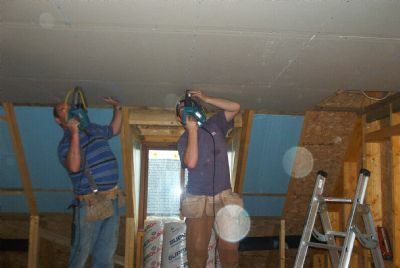 After lunch we make a start on the plasterboard - Alex and Stuart do the work as Jerry watches! 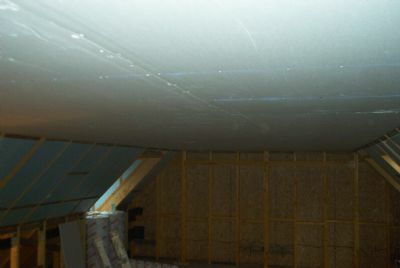 By the end of the day the upstairs ceiling is finished, and we are ready to start on the end walls first thing tomorrow. 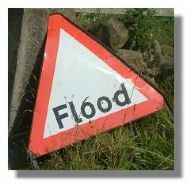 Very heavy overnight rain and severe storms closes both roads to Bonar Bridge and prevents the contractors and ourselves from getting to site. Better news tomorrow - we hope! 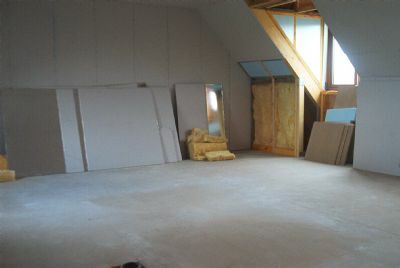 Despite the Dornoch/Bonar road remaining closed all day we get to site via Ardgay and the joiners have a good day fitting insulation and plasterboard. 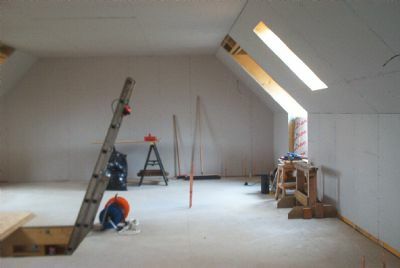 At the end of a trying week we have still made great progress and look forward to finishing plasterboarding the dormers on Monday and then making a start on the partition walls. Watch this space.